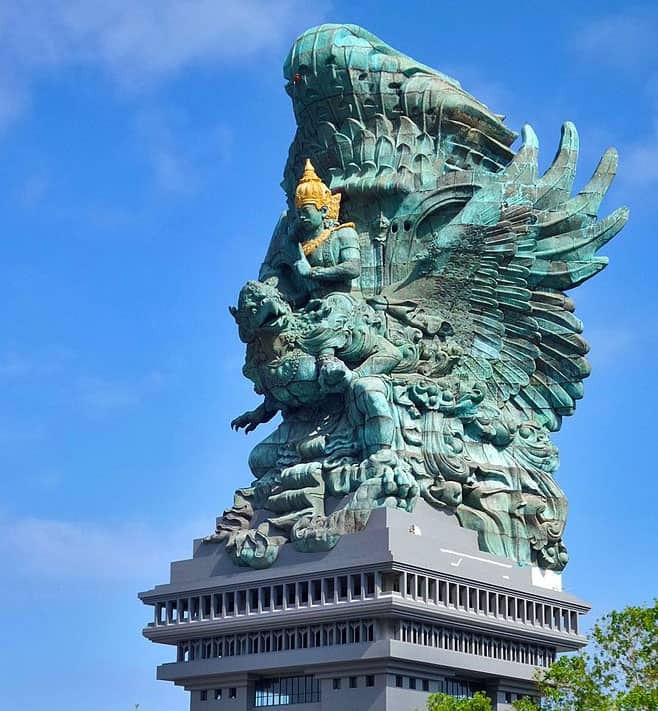 Upon your arrival in Bali, as you face the southern part of the island, you may see a towering figure in the distance, Garuda Wisnu Kencana statue. 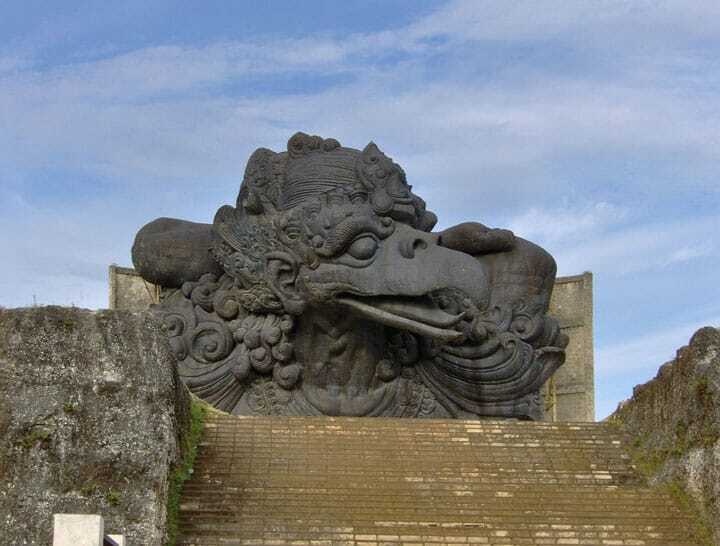 This towering figure is none other than the behemoth-sized statue known as the Garuda Wisnu Kencana (GWK). It is located in Ungasan area on the southern part of Bali. It is dedicated to the Hindu God of Vishnu and his mount, the mythical bird Garuda. This colossal statue was completed in August 2018, and was inaugurated by the seventh Indonesian President Joko Widodo on September of 2018. It was built with the intention of being Bali’s landmark, which lives up to its name, as the statue is visible from many locations on the island due to its immense size. Now the GWK statue serves as a cultural park where visitors can come and see the statue itself, as well as other cultural dances and performances. 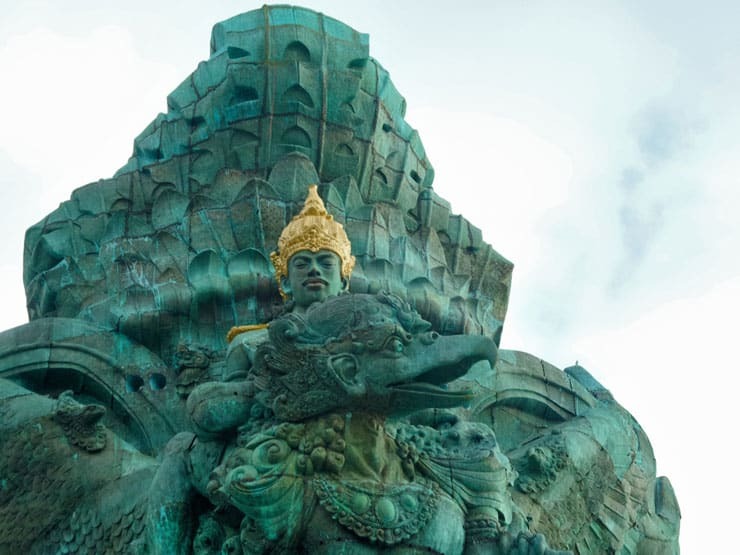 Below are some interesting facts and tidbits about the Garuda Wisnu Kencana Statue. Garuda Wisnu Kencana stands 121 meters tall with a wingspan measuring 65 meters, making it taller than the Statue of Liberty by up to 30 meters. It is considered to be the third tallest structure in the world after the Spring Temple Buddha, which towers at a height of 153 meters, and Myanmar’s Laykyun Sekkya Buddha at 135 meters. Domestically however, it remains the tallest structure in all of Indonesia. While the master architect of the GWK statue is credited to I Nyoman Nuarta, the overall project is the collaboration of up to 120 artists. The statue itself is made of 3,000 tons of copper and bronze slabs to reach its current height. It is also the heaviest statue in Indonesia. The total construction project of the GWK, from concept to finish, took a whopping 28 years. It was designed initially in 1990 by I Nyoman Nuarta. The actual construction of the monument began in 1997. The statue is a design masterpiece that combines the elements of art, technology and science to make it withstand the powerful tropical storms in Bali as well as earthquakes. The Garuda Wisnu Kencana is a must-visit whenever you get a chance to come to Bali. Only seeing it in person will you appreciate its grand design and colossal size. If you’re planning a trip to Bali and would like to stay near GWK, reach out to us at Sun Island Bali. We’ll be sure to accommodate you and show you some points of interest in Bali.